It has been a rainy rainy week. Besides being Wednesday and then rainy on top of that well, you know it gets a little ho hum. 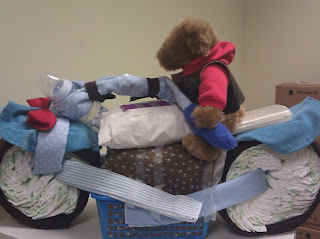 been working on a surprise diaper cake for a friend. not done yet but this is similar to what it will look like. this is one I did years ago for someone. they are fun to make but a lot of labor involved. roll and tie the diapers, make a support onto the cake cardboard to support as you go up, arrange diapers, then arrange the other things in a pleasing way. wrap all in ribbon. I also made one (two actually) last year to look like a motorcycle. those were real fun. took forever to figure it out but they came out so cute! they were both for boys. the seat was made of diaper wipes and the fenders were bibs. the red "lights" were peepee teepees for boys. google them LOL the frame was made of receiving blankets. it has in it 7 receiving blankets, 2 bibs, 4 peepee teepees, pair socks(handlebar grips), bottle (light at front over fender), something like 150 diapers, 3 plastic containers diaper wipes, small diaper wipe container, wipe refills, keys rattle and bear stuffed animal, and a small plastic basket for organizing. well gotta get busy. thats a lot of diapers to roll up. Need to have them done by this Friday so gotta run. WWQD what would quilters do?